Dan Ishler hails from the north end of Whidbey Island in Oak Harbor, where he makes a wide range of beautiful stoneware and porcelain vessels. Ishler has made his living as a potter since the late 1970s, but in the past 20 years has focused primarily on creating one-of-kind pit-fired or crystalline glazed pieces. The artist's fascination with clay began in the fourth grade. "I was basically hooked then, butdid not realize it until my college years, when I was reintroduced to clay and its magical qualities," Ishler said. "I’ve always enjoyed building and creating things, from model race cars, airplanes and backyard tree houses to working with wood and metalin my dad’s shops, but was intrigued by clayand its intimate responsiveness to the touch of my hand, rather than a grinder or saw." This intimacy is revealed in each piece, which he makes using only his hands and potter's wheel. "I work with a small series of similar forms, concentrating on and exploring the subtle aspects of each emerging piece, actually feeling the shape, as much as seeing it," the artist said. The pieces are then surrendered to the fire, where they are transformed again. 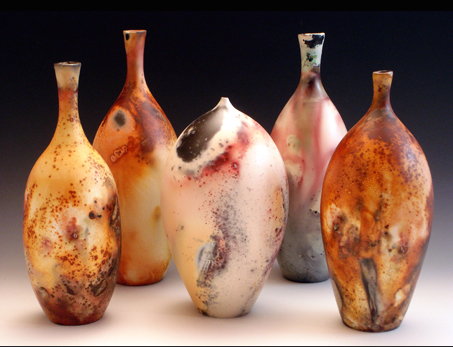 The clay and glaze combined with heat, interact and produce another variation of the piece. "Opening a kiln is always a surprise," he said. "Good or bad, it is never exactly what you had envisioned. That is the hook and what drives me to make just one more thing and get it exactly right." To inquire about Dan Ishler's currently available work, please contact the gallery at 800/858-5063.